A leading Democratic activist is worried that the 2020 candidates' defense of late-term abortion may deal long-term damage to the party. Kristen Day, executive director of Democrats for Life, said that her party's embrace of late-term abortion may win fundraising dollars from mega-donors like Planned Parenthood and NARAL, but will alienate voters come the general election. "This abortion position is the most extreme it has ever been," she told the Washington Free Beacon. "They're all fighting for the abortion lobby vote and that could turn around and hurt them all in the general election." Her comments came two days after former Rep. Robert Francis "Beto" O'Rourke endorsed abortion in the third trimester. O'Rourke was playing catch-up to the declared Democratic nominees in the Senate, all of whom voted against a bill that would guarantee care for children who survive abortions. The defense of not only late-term abortions but allowing newborns to die on the table, has been an eye-opening departure from former President Bill Clinton's hope of making abortion "safe, legal, and rare." "Safe, legal, and rare is something most pro-life Democrats could accept, but paying for abortion up to nine months with federal funds is extreme," she said. "When you talk about abortion extremism you're going to lose votes particularly the one-third of Democrats who identify as pro-life and think life is worth protecting." Democrats for Life is a boutique operation run out of Virginia and has chapters in 20 states. Day said membership has doubled since January when New York passed a law eliminating any limits on abortion up until the point of birth. It shot up even further when Virginia Democratic Gov. Ralph Northam endorsed withholding life-saving care from abortion survivors unless the mother asked for it. Interest has expanded beyond the stereotypical religious abortion opponent who still supports the liberal agenda on healthcare, taxes, or union membership after those developments. "We've received lots of calls from Democrats who oppose late-term, but still are in favor of first trimester abortions," she said. "I'm expecting that number to keep growing." Democrats for Life aims to provide a "bigger tent" for the party. The group's chapters have pushed for conscience protection clauses and open-minded language in state party platforms to indicate abortion support has not become a litmus test. That effort has been met with fierce opposition. Missouri Democrats eliminated a sentence that acknowledged there could be disagreement on the issue after public outcry from the abortion lobby. On Wednesday, Democrats for Life sent a questionnaire to the declared 2020 candidates asking if they are "open" to having pro-life members in the party's ranks. "The 2016 Democratic Party Platform insists that there be no limits at all on abortion during the full term of pregnancy, calls for the repeal of the bipartisan Hyde Amendment, and removes any reference to conscience protections. Do you support the 2016 Democratic Party Platform language regarding abortion?" one question asks. She said the 2016 platform represented a stark change in Democratic politics. While the party has largely been steadfast in its support for the right to an abortion, it had previously acknowledged the tragedy of the situation that many who seek abortion, particularly late-term, find themselves in. In 2019, many prominent candidates seem just "repeat the abortion lobby's talking points." Day would rather see a Democratic Party that seeks to empower and care for vulnerable pregnant women, "so they aren't forced to choose abortion." 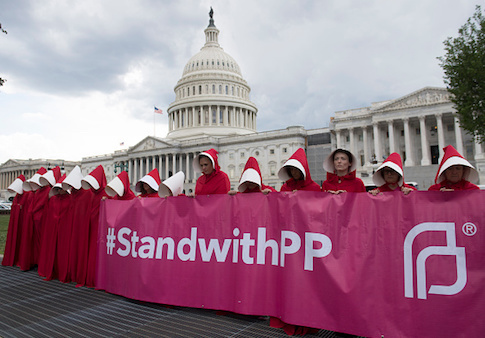 That is not the message coming from the Planned Parenthood wing of the party, no matter how well-meaning some of its proponents may seem. "They don't care about women in crisis. They really don't," she said. " Why do we consistently turn our backs on women in crisis pregnancy?" Many Democrats Day spoke to stayed home in 2016 after the party adopted a platform backing taxpayer-funded abortion. She said the problem will only grow if the party continues on the path toward defending late-term abortion. Polls have found that 80 percent of voters, including a majority of Democrats, support limits on late-term abortion. Day said the party would be foolish to dismiss the number of reliable Democrats willing to stay home if the party continues to embrace radical abortion positions. "We're not asking for a total change, only that our point of view should be respected," she said. "There is definitely a breaking point." This entry was posted in Issues and tagged 2020 Election, Abortion. Bookmark the permalink.